British Motor Museum to host an exciting transport show for all the family! The British Motor Museum is to host the 'Gaydon Festival of Transport' on Sunday 29 May. The general transport show will feature a range of motorised transport from cars through to Fire Tenders and Tanks along with plenty of family entertainment. This exciting family show aims to bring all classic vehicles together highlighting some of the best classics ever produced. 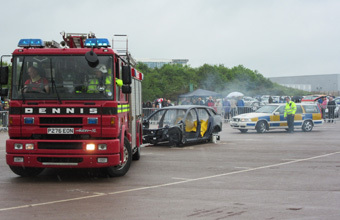 Hundreds of vehicles, from sports cars to emergency service vehicles are expected to take part in what is deemed to be a great family show. This year classic emergency service vehicles in action will be the main focus of the show. These working vehicles will demonstrate and highlight the power of fire truck pumps and military vehicle capabilities. Family activities includes Miniature Crazy Golf, Bouncy Castles, Falconry, Laser Clay Pigeon Shooting, Bug Tent and Face Painting. As well as entry into the show, the admission fee also includes entry into the newly refurbished British Motor Museum and brand new Collections Centre allowing public access for the first time to an additional 250 cars from the reserve collections of the British Motor Industry Heritage Trust and the Jaguar Heritage Trust. Tom Caren, Show Manager at the British Motor Museum said, "The Gaydon Festival of Transport is set to be another highlight in the motoring events calendar. As well as appealing to classic car enthusiasts, we hope visitors come along and join in with what promises to be a great day out for all the family". Tickets for the show cost £10 in advance or £14 on the day for adults, £6 in advance or £9 on the day for children and £39 on the day for a family. Family activities are included in the admission price except Laser Clay Pigeon Shooting and Bouncy Castles.